Using Ada technologies to develop video games doesn’t sound like an an obvious choice - although it seems like there could be an argument to be made. The reverse, however, opens some more straightforward perspectives. There’s no reason why a code base developed in Ada couldn’t benefit from a game engine to support the user interface. Think of a flight simulator for example, running a mission computer in Ada. In the past few years, a number of these have been made available to a larger audience, mostly to serve the so-called indie scene. In this blog post, we’ll concentrate on Unity, which has the advantage of using the Mono environment as scripting language. As there is no flight mission computer at AdaCore, we’ll use a slightly modified version, the SPARK/Ada example already ported to a number of environments. So that’ll be a game in Ada after all! You can get the code on AdaCore’s Github repository. It has been developed for Windows, but should be easily ported over to Linux (the directive “for Shared_Library_Prefix use "";” in the GNAT Project file may be all you need to remove - see more information in the Ada project setup). The Ada folder contains what’s necessary to build the native code, the TetrisUI contains the Unity project. You will need both GNAT and Unity for everything to work. Unity can be downloaded from https://unity3d.com/. During the installation, make sure that you select the correct version - 32 bits or 64 bits - matching your GNAT compilation environment. In particular, to date, GNAT GPL is only provided with a 32 bits code generator on Windows, and 64 bits on Linux. Once the Ada project is built, make sure to copy the resulting library under the Asset/Plugin directory of the Unity project. This will be described in more details below. Now, let’s dive into the project. We’re going to skip the section describing the development of the Tetris code. There’s a full explanation available . Note that interestingly, we’re not only interfacing Ada, but actually SPARK code. This provides a good demonstration of a typical situation with Ada, where the core safety-critical functionalities are developed using a higher safety standard (here the core of the game), which can then be integrated in various environments with fewer safety constraints (here the user interface developed in Unity). As said in the introduction, Unity runs mono - an open-source version of the .Net platform - and therefore allows you to develop scripts using the C# language. So, exporting our Ada code to Unity will turn out to be interfacing Ada and C#. We specify here the fact that the library is dynamic (for Library_Kind use "dynamic";) and that it should encapsulate all dependencies, in particular the GNAT library (for Library_Standalone use "encapsulated";). That second setting is important, otherwise our library would only work if the GNAT run-time is also provided. By default, the build system (gprbuild) will add a “lib” prefix to the library name. I’m personally working on Windows and don’t fancy having this prefix which doesn’t really look natural. This behavior is cancelled by the clause (for Shared_Library_Prefix use "";). On Linux, where you’re likely to want this prefix, you may need to remove that clause. There’s no direct way to export from Ada to C#, but as the C# Platform Invoke (PInvoke) services allow us to call native C code as often, we’re going to go through C conventions for the interfacing. As a disclaimer, to anyone that is already shaking to the idea of interfacing virtual machines and native code - fear no more. Using PInvoke is surprisingly easier than using something like the Java Native Interface for the jvm - at least for basic interfacing. In our case, for Ada, it will be nothing more than exporting proper symbols. I’m using Ada 2012 aspects here, as opposed to the usual “pragma Export”, but the effect is the same. This is declaring the C call convention, exporting the procedure to a C symbol “tetris_cycle”. And that’s it! We’ll of course need to make sure that the library is at the correct location to be loaded, but again, that’s for the next section. One last point of importance - exceptions. The core of the game is written in SPARK and all run-time checks have been proven. So we know that when called properly (ie respecting preconditions) this code cannot raise any exception. However, there’s no such checks at the C# to Ada interface level and it’s quite possible that values passed from C# to Ada are wrong. A good example of this is board coordinates, which are constrained between 1 .. X_Size and 1 .. Y_Size but mapped into regular integers. Nothing prevents values in C# to be wrong, and thus to issue an exception when being passed to Ada. The resulting behavior is quite annoying as C# has no way to catch Ada exceptions - Unity will just crash. As it turns out, it happened to me quite a few times before I realized what was happening. Returning the “Empty” literal is far from ideal. There’s no information passed to Unity that something wrong happened. However, this is enough to keep things going. Integer is quite logically mapped into int. I have to admit that I used implementation knowledge for the return type. I know that it’s a small enumeration that turns into an 8 bits unsigned int, hence the “byte” type. As it turns out however, this implementation knowledge is available to everyone. The -gnatceg switch from GNAT allows to generate a C interface to Ada. The resulting C header files can be directly used to develop C code or to interface with anything (like C#). And as a matter of fact, we could even have used these in the SWIG tool we mentioned before to automatically generate C# and - hey - use their interface to exception handling mechanism! We need to be able to access to this type from C#. Again, using -gnatceg we can see that the compiler generates a structure with two unsigned 8 bits integers and 2 regular integers. This is -non portable- insights on the compiler behavior. To do proper interfacing, it would probably have been better to declare this structure and all the types as being C convention. But we’re taking shortcuts here for the purpose of the demonstration. Used in various places in the interfacing. In summary, interfacing Ada and C# comes with a couple of hurdles, but is overall relatively painless. The code and this article take a number of shortcuts and present alternatives to the interfacing. Using this in an industrial context would require a bit more care to make sure that the interfaces are portable and safe. And even better, automatic generation of the wrappers and interface would be ideal (a bit like GNAT-AJIS for Java). The question of exception handling still needs to be worked out but for a demonstrator, that’s good enough. We now have an Ada library ready to be used from within Unity. Let’s play! There’s many things to know about Unity and we’re not even going to begin scratching the surface. For more detail, there’s a massive amount of tutorials and books available. We’re only going to provide a high level view of the concepts we deployed in this demonstrator. In order to run the example, the one thing you will need to do is to build the Ada library (see previous section) and to copy it to the Resources asset folder described below. The first time a Unity project is open, it shows a game scene. There may be many scenes in a game, but for Tetris we’ll only need one. The objects of that scene are listed in the list on the left. These are the ones which are statically defined, but as we are also going to create a couple of objects dynamically, these objects are typed after GameObject. Unity is using an interesting component based design method, where each GameObject is itself composed of components (shape, renderer, position, scripts, etc). Clicking on the Main Camera object, we’ll get the list of these components on the right panel. In particular a Transform at the top, specifying matrix transformation for this object (position, rotation...), a Camera component for what is specific to the camera (in particular switching between orthographic and perspective projections), and at the end a script called Tetris, which will contain the behavior of the game. We decided to associate this script to the camera component, but as a matter of fact, it won’t have to interact with the camera, we could just as well have placed it anywhere. At the bottom of the screen, we have the Assets. The components and game objects used to build the scene. Two scripts - Tetris that we discussed already and Cell which we’ll see briefly in a bit. A material called “CubeMat” used to render cubes and the Main scene. There are also two directories, Resources and Plugins. In the Asset folder, developers are mostly free of organizing elements the way they want apart from a couple of special directories, these two in particular. The Plugins directory in particular is responsible for containing the dynamic libraries to be loaded by Unity. When checking the project out, it should be empty. Just drag and drop tetris.dll (or libtetris.so) here to complete the project. Resources contains objects that can be dynamically instantiated. Here, Cell is going to be one cell on the screen. Clicking on it, you’ll see that it has a position, a collider, a renderer, a material, and a filter (responsible for the shape - or mesh - of the object). It’s also associated with a script also called Cell, which implements some specific services. And that’s pretty much it. Clicking on the play button on the top, you should be able to launch the game, move bricks with the arrows or accelerate the fall with the space key. Note that stopping and relaunching the game from within the same Unity instance will not reset the board. This is because the library is actually loaded within the Unity environment itself, not in response to the play button. To reset, we can either re-launch Unity, or extend the implementation with some initialization code launched at game start. The UI for this Tetris is very basic. It’s a 10 * 38 grid of pre-loaded cubes, that we’re going to make appear and disappear depending on the state of the core game. It’s arguably a bit of a shame to use a tool such as Unity and turn it into such a basic implementation - but it has the benefit of adhering to the core developed in Ada, which can then be ported to much more crude environments. It’s all ready to be extended though! Which returns a GameObject. As seen before, this GameObject is associated to a script Cell. In Unity, all these scripts are actually descendent of the type Behavior or MonoBeharior. What’s nice about the component based model of unity is that it’s always possible to get any components of a given object from any other component. In other words, I can store this object through a reference to a GameObject or using its Cell directly. The rest of the code is pretty straightforward. Update() is another of these magic functions, this one is called at every frame. We’re calling tetris_cycle() regularly to update the game, and subsequently activating / deactivating cells depending of the status of the board. The Cell script has some other interesting elements. The first thing it does (in Awake) is to duplicate the material in order to be able to change its color independently of others. The color is then changed in the Renderer component from SetKind. 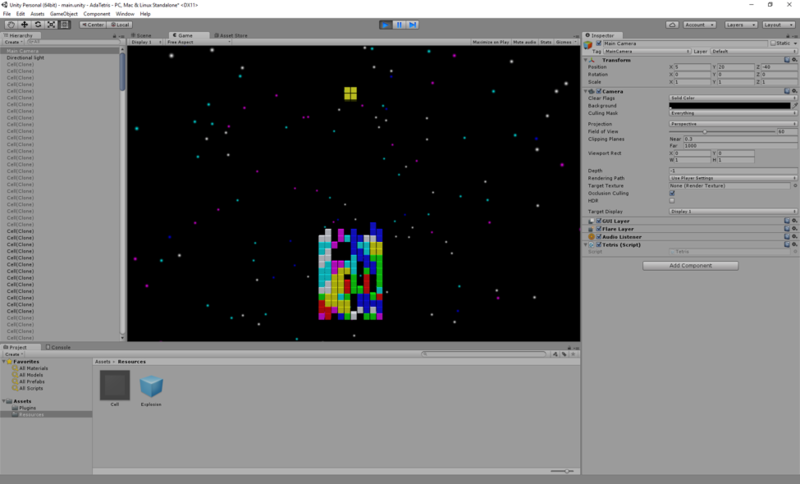 Last but not least, the Explode function creates an instance of the explosion particle system to give a little something when a line is destroyed. There are various things to play with from there. The game itself is merely a proof of concepts, and many things can be added starting with a button to reset the game, a button to exit it, score, etc. The Ada to C# interfacing techniques can also be greatly improved, ideally through automatic binding generation. And of course, it would be nice to have a more comprehensive piece of Ada code to integrate into a larger scale project. All the pieces are here to get started!